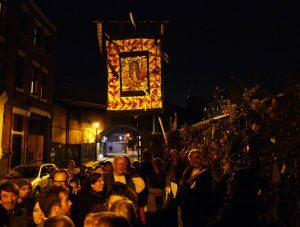 The 173rd Vigil (held on the 23rd of every month since June 2004) to remember the outcast, dead and alive, to renew the shrine and to reclaim the secret history as revealed by The Goose to John Crow. This being our portal to Halloween / Samhain, we’ll be observing some of the rituals for the dead traditionally associated with The Halloween of Crossbones. You’re welcome to bring your own mementos or ribbons with the names of your lost loved ones to tie to the gates, and/or a poem, song or short personal testimony to share. Support the campaign to protect the Cross Bones Graveyard Memorial Gates and to create a Garden of Remembrance on the site.